Senon Trevino, 77, of Helena, MT, passed away peacefully with his wife of 35 years, by his side. Per his final wishes, cremation has been entrusted to Croxford Funeral Home. No services have been planned at this time. Senon was born on December 27, 1941 in Kemp, TX, to parents Joe Trevino and Dominegue Gutierrez. He and his brother Joe later moved to Frederick, CO, where he was raised by his grandfather. He attended school in his home town of Frederick and in high school he was awarded letters in baseball, basketball, football and track and field. Senon had a deep love for horses and was passionate about horse racing. He became a professional horse jockey and also spent time as a horse trainer/conditioner. 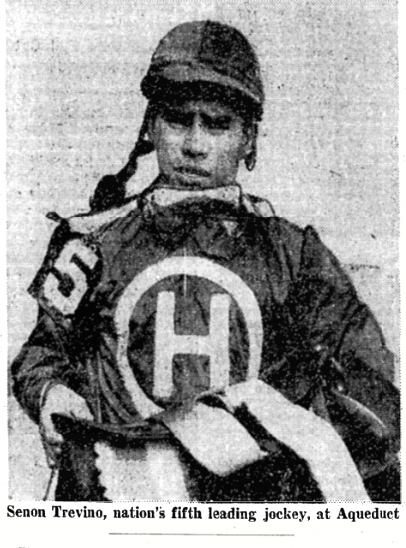 In 1964, Senon was the National Champion Apprentice Rider. He was the leading rider at Tanforan and the leading apprentice rider at Hollywood Park, Washington Park, and Arlington Park. In 1984 he met Marilyn Parker, and she became the love of his life. They spent 17 years together, and then on May 5, 2001, got married in Helena, MT. They continued their love story for another 18 years, until Senon passed away. In those 35 wonderful years together, their lives were blessed. Senon was devoted to his family, passionate about horses, enjoyed the outdoors, and was a perfect marksman. He will be forever missed by his family and friends. He is survived by his wife, Marilyn Trevino; sons, Senon Jr. and Steve; daughters, Helena and Sara; and brother, Frank Trevino, and many other relatives and friends. He was preceded in death by his parents, Joe and Domingue Trevino.